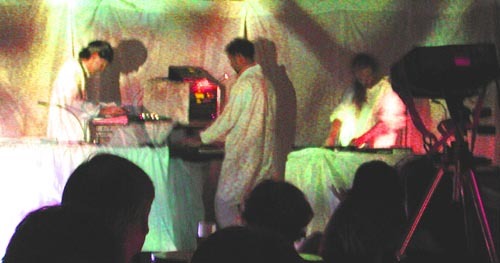 The Drone Cycle 2000 was a series of concerts in which dreamSTATE visited one note of the chromatic scale each month of the year as a foundation for ambient improvisations with a rotating cast of special guests. 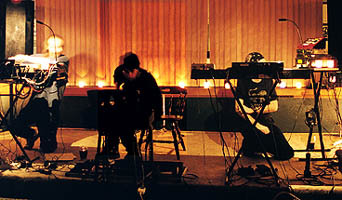 The drone note was not omnipresent and was only implied at times, but was a home and harbour while venturing into unrehearsed experimental ambient improvisations with each guest before a live audience. 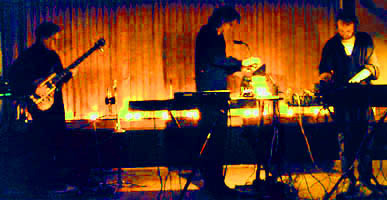 The series was hosted by THE AMBiENT PiNG - Toronto's then-weekly live ambient performance event. Wally Jericho helped us launch the Drone Cycle in an evening of improvisations around the note C.
Knowing Wally's abilities on trumpet, bass, minidisks, loops and treatments, his good nature and his feel for ambient music meant we had a high confidence level for the night ahead. 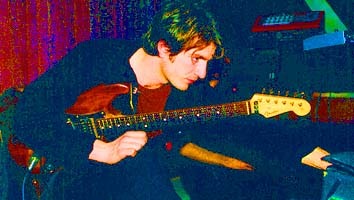 Wally had retuned his bass to all Cs and Gs which lead to some extra low bass drones and lovely harmonics. 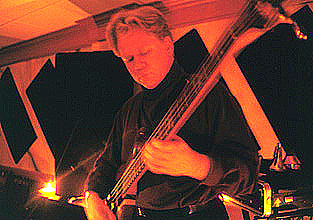 He told me later that he left the bass tuned that way for months after the show as he enjoyed the new possibilities. February's drone was C# and our special guest was Kurt Swinghammer. Kurt is well known around Toronto as a visual artist (murals, paintings, CD covers, etc...), a unique pop singer (Vostok 6 is his latest CD), a guitar ace (Sarah Slean and Ani DiFranco are two recent gigs) or a video art director (Maestro Fresh Wes, Colin James, etc...) but few would suspect he's also a creative electronic musician/experimentalist with a wicked arsenal of devices and a good feel for ambient. 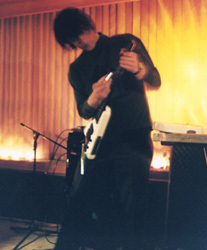 Onwards to D with our next guest Michael Rockwood on guitar, loops and effects. I had once played with Michael a year before - at my first excursion with Planet Of The Loops (you can find that story here) and had experienced his wonderful sense for space. 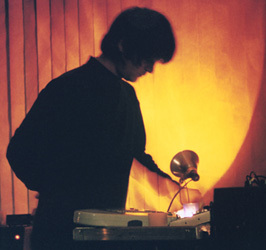 Talking with him after that show, I also learned of his deep appreciation for David Toop's book "Ocean Of Sound" and his interest in experimental musics. After confirming his participation in the Drone Cycle for March 14th, he invited dreamSTATE to open for his band Zoebliss at their CD release party on the 11th, which we accepted. He joined us for the end of our set and thus Jamie and I had a taste of what could happen at our own show. Click on the photo for more images from that night.